In the raging hot summer close to 800 dev devotees and Ethereum enthusiasts took shelter in Postbahnhof, the former train station made into a beautiful venue, to workshop, learn and discuss the state of the art of Ethereum. DAppcon 2018, was held in Berlin this July. “The city’s creative and alternative character clearly resonates with those pursuing the transformative power of blockchain technology”, Gnosis commented on the choice of location. The event was organized by Gnosis, a prediction market platform and one of the first to develop an app for Ethereum in August 2015. Scaling, building and tooling of Ethereum applications were the core topics as this nonprofit conference aimed to get the community together to work on the foundational infrastructure of Ethereum. The conference offered a great way of understanding where the community is at today, the talks gave a really good overview of what differens companies are working on and what still needs to be done. As Superblocks is in a build up phase we participated to get a good idea of what people are building, want to build and are struggling with. We also wanted to, and did, make some good connections with builders and tool makers that we think could benefit from a cooperation with Studio to superpower the way DApps are built. Already the first morning we had a great breakfast with Portal.Network. Besides the love for coffee we found some really great touching points between our visions and projects. The guys from Zeppelin where also impressed with Studio Online which was great for us, since we hope to incorporate their ZeppelinOS into it. 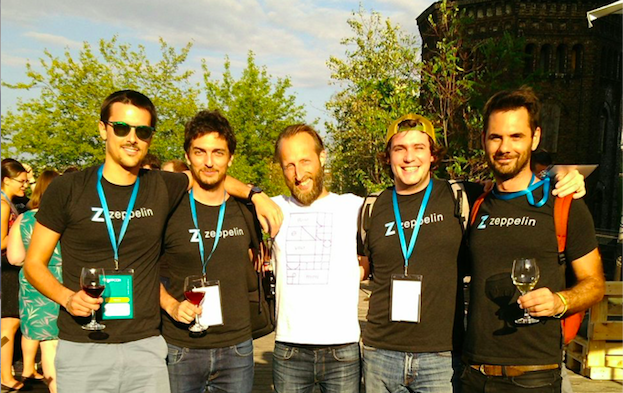 Superblocks Co-founder Thomas Backlund enjoying the sun and DApp talks with Zeppelin. A Truffle work shop gave really good ideas of how their framework can be integrated into our next version of Studio (sign up to our Telegram or follow us on Twitter to not miss the release that is coming up soon). Looking forward to seeing this bunch again at Trufflecon. 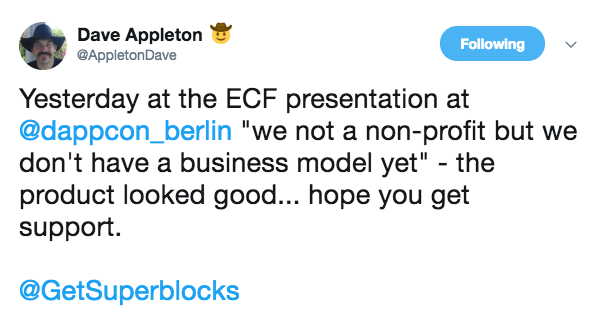 Thomas, our founder, got a lot of laughs as he took the mic for open questions during the Ethereum Grant speach (ECF) and pretty much summarized the enigmatic blockchain space - creative visions ignoring classic conventions. Dave Appelton, amused by the honest, but yet so common, statement. It was a rewarding event with where we saw a lot of excitement for Superblocks Studio Online and the upcoming Studio Pro. It was also really interesting to do what we love, see what people are building and creating! The others relate to specific technologies of all sorts (e.g. keybase-like services, new approaches to dutch-auction based strategies, analytics). Decentralized DNS — Not only about Decentralized DNS, but also many other interesting insights. DAppNode — A good initiative on the side of expanding the “server” base, helping to move away from central players serving REST-like services. The rest relate to miscellaneous (e.g. reward-systems, cyber-society, curation, Parity and friends, and token standards). 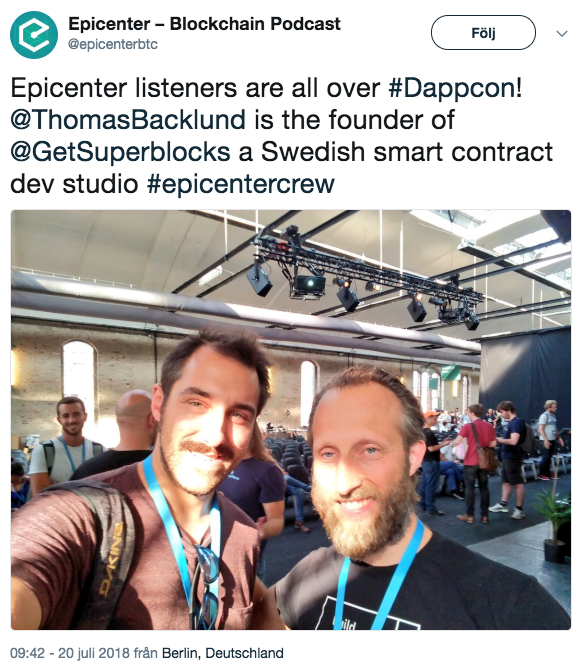 DAppcon — catch up on the cutting edge of blockchain development was originally published in Superblocks on Medium, where people are continuing the conversation by highlighting and responding to this story.